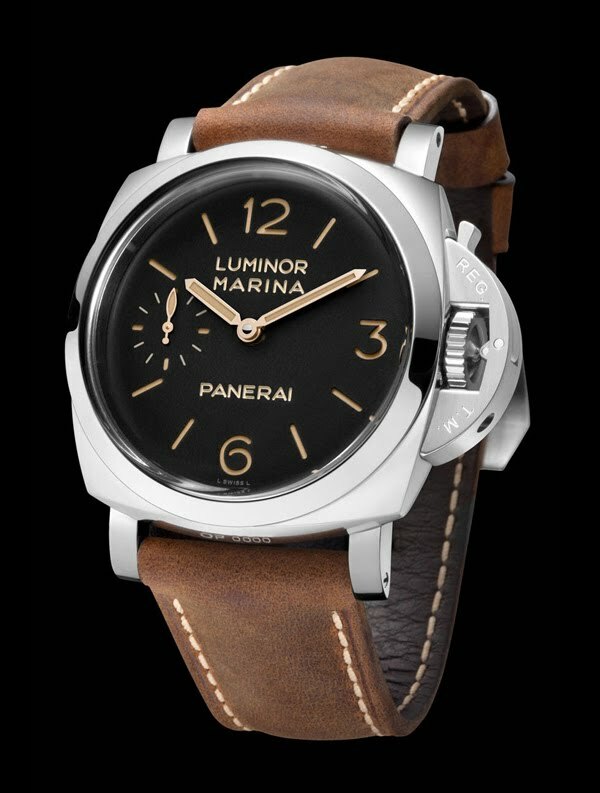 The Luminor Marina 1950 3 Days and the Luminor 1950 3 Days Power Reserve express the excellent combination of vintage design and technology which makes Panerai watches unique. The special design of the Luminor 1950 case used by the two models is inspired by a rare, historic watch which is notable for the pronounced rounding of the cusps of the caseband. This detail recalls a stage of transformation, which took place in the 1940s, from the classic Radiomir cushion case to that of the Luminor. The Luminor Marina 1950 3 Days and the Luminor 1950 3 Days Power Reserve are both fitted with the new P.3001 and P.3002 manufacture calibres, which are distinguished from each other by the different ways in which the power reserves is indicated. In the P.3001 the power reserve indication is located on the bridge of the movement, and is therefore visible through the crystal on the back, while in the P.3002 the indicator appears on the dial. With a diameter of 16½ lignes, the two calibres have in common the typical structure of large bridges, two spring barrels giving a power reserve of three days and a balance wheel 13.2 mm in diameter with variable inertia, enabling the rate of the watch to be adjusted through external screws on the rim. Both also have the seconds zero reset device and a mechanism for the rapid adjustment of the hour, enabling the hour hand to jump one hour at a time, without interfering with the movement of the minute hand or the running of the watch. Hand-wound mechanical, Panerai P.3001 calibre, executed entirely by Panerai, 16½ lignes, 6.3 mm thick, 21 jewels, Glucydur® balance, 21,600 alternations/ hour. Incabloc® anti-shock device. Power reserve 3 days, two barrels. 207 components. Hours, minutes, small seconds, power reserve indicator on the back, seconds reset. (protected as a trademark) Brushed steel. Black with luminous Arabic numerals and hour markers. Seconds at 9 o’clock. Sapphire, formed of corundum, 3 mm thick. Anti-reflective coating. 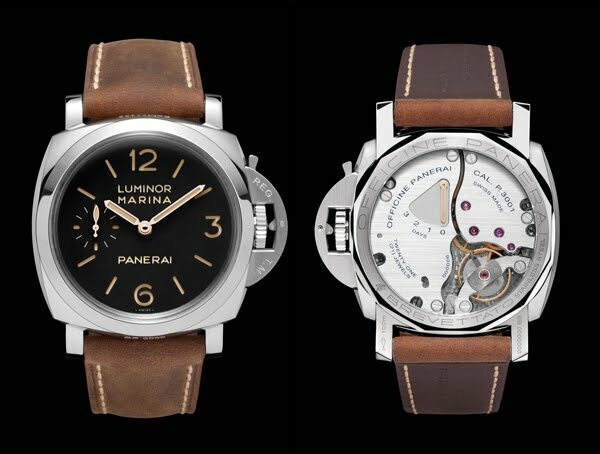 PANERAI personalised leather strap and large-size brushed steel buckle. Supplied with a second interchangeable strap and a steel screwdriver.